There was a moment in the first encore of Sting's three-hour "Symphonicity" performance when I felt like I was at a party. I was standing in the eighth row with my 10-year-old son, and the crowd had pushed gently into the large aisle dividing the first two sections on the floor. Cameras were flashing. People were dancing. And there, elevated on the stage, backed by the Royal Philharmonic Orchestra, Sting was dancing like a teenager. I've been to a lot of concerts in my 40-plus years, and I don't think I've witnessed a performer with as much confidence and charisma on the stage as Sting. As he sang his final song a capella, the haunting "I Was Brought to My Senses," the entire crowd stood silently, almost reverently. And very few people left early. As I watched this scene unfold, I remembered an interview with Stuart Copeland, drummer for the Police, where he said Sting had the ability to pick up just about any instrument and make it sound amazing. It didn't matter if it was a lute, a guitar, or a tambourine. Now he was standing in front the biggest band he'd ever brought on the road, and he'd never seemed so exposed. Even with 50-plus musicians sharing the stage with him, Sting possessed the most powerful instrument there: his voice. Unlike the bombast of a rock band, a symphony is about subtle colors and variations of sound. Within this musical context, you could hear the precision and clarity of Sting's voice better than ever. Like a lot of people, I thought the idea of Sting going out on tour with an orchestra seemed a little pretentious and grandiose. Plus, just about everyone has done it already. But I also knew he might do something really different and interesting. Of course, many the old Police songs sounded good, too, especially "King of Pain." This was my fourth outing with Sting -- I'd seen …Nothing Like the Sun, Ten Summoner's Tales, and Sacred Love tours -- and this one was right at the top of all of them. 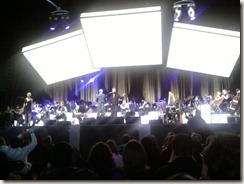 I especially enjoyed how Sting introduced some of the songs and talked about how or why they were written. I'd never heard the story behind how he wrote "Russians" (he had a friend in New York who could pick up Russian TV broadcasts, and they ended up watching Russian children's shows that Sting said were really beautiful). Also interesting were the intros to "Moon Over Bourbon Street," (he thought he was being followed in the French Quarter in New Orleans), "The End of the Game" (he talked about his henhouse being plundered by a fox), and "Tomorrow We'll See" (he wrote the music first and then waited for the "voice" to pen the lyrics; he was surprised it was a transsexual prostitute). Sting also apologized for the bad weather (I think it rains every time he visits Seattle). He joked that he wanted to wait until summer to do this tour -- but this wasn't summer weather. But he said he felt at home, since the weather was similar to England's. I've heard that the way Sting makes decisions about his music and career is he always wants to surprise people. For example, right when everyone had given up on the Police reuniting, that's exactly what he did. And in addition to his Pop albums, he's done a Baroque album, "Songs from the Labyrinth," and a Christmas album, "If on a Winter's Night." Looking back on that progression, "Symphonicities" starts to make more sense. This desire to keep changing and evolving is one of the reasons Sting remains one of the world's most popular musicians. 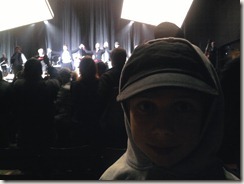 After the show, I told my son he'd probably seen one of the most famous people in the world. When he asked why, I said that Sting could go to practically any country and play a concert (and people would come). There are only a handful of artists in the world who can do that.